Microorganisms are rarely found in Nature swimming freely in an unbounded fluid. Instead, they typically encounter other organisms, hard walls, or deformable boundaries such as free interfaces or membranes. Hydrodynamic interactions between the swimmer and nearby objects lead to many interesting phenomena, such as changes in swimming speed, tendencies to accumulate or turn, and coordinated flagellar beating. Inspired by this class of problems, we investigate locomotion of microorganisms near deformable boundaries. We calculate the speed of an infinitely long swimmer close to a flexible surface separating two fluids; we also calculate the deformation and swimming speed of the flexible surface. When the viscosities on either side of the flexible interface differ, we find that fluid is pumped along or against the swimming direction, depending on which viscosity is greater. M. A. Dias and T. R. Powers PoF (2013) Arxiv and Journal. 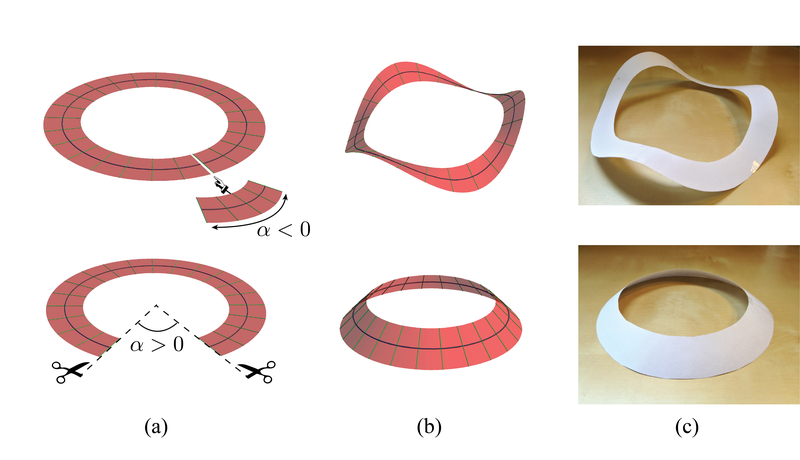 We consider the equilibrium shapes of a thin, annular strip cut out in an elastic sheet. When a central fold is formed by creasing beyond the elastic limit, the strip has been observed to buckle out-of-plane. Starting from the theory of elastic plates, we derive a Kirchhoff rod model for the folded strip. A non-linear effective constitutive law incorporating the underlying geometrical constraints is derived, in which the angle the ridge appears as an internal degree of freedom. By contrast with traditional thin- walled beam models, this constitutive law captures large, non-rigid deformations of the cross-sections, including finite variations of the dihedral angle at the ridge. Using this effective rod theory, we identify a buckling instability that produces the out-of-plane configurations of the folded strip, and show that the strip behaves as an elastic ring having one frozen mode of curvature. In addition, we point out two novel buckling patterns: one where the centerline remains planar and the ridge angle is modulated; another one where the bending deformation is localized. These patterns are observed experimentally, explained based on stability analyses, and reproduced in simulations of the post-buckled configurations. M. A. Dias and B. Audoly JMPS (2014) Arxiv and Journal. We develop recursion equations to describe the three-dimensional shape of a sheet upon which a series of concentric curved folds have been inscribed.In the case of no stretching outside the fold, the three-dimensional shape of a single fold prescribes the shape of the entire origami structure. To better explore these structures, we derive continuum equations, valid in the limit of vanishing spacing between folds, to describe the smooth surface intersecting all the mountain folds. We find that this surface has negative Gaussian curvature with magnitude equal to the square of the fold’s torsion. A series of open folds with constant fold angle generate a helicoid. M. A. Dias and C. D. Santangelo EPL (2012) Arxiv and Journal.